We ventured across the Ohio River one rainy afternoon during our recent Cincinnati trip to visit neighboring Newport, Kentucky for a little geocaching. Our search for a virtual cache took us to the World Peace Bell. The bell, a project managed by Cincinnati’s Verdin company and billed as the “world’s largest swinging bell”, is 12 feet in diameter and weighs 66,000 pounds. 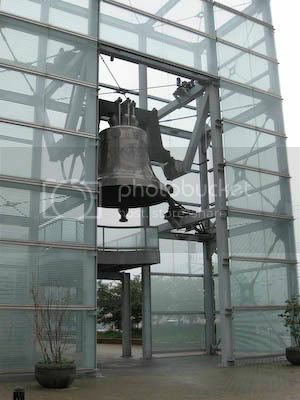 Installed in 1999 at the Millennium Monument site in Newport, the bell first rang at the site on January 1, 2000. A French foundry cast the copper/tin bell and Cincinnati/Newport area companies created most other components of the bell and tower. Although we visited around noon, the bell didn’t ring during our visit, and the nearby center and store dedicated to the World Peace Bell wasn’t open. However, we got credit for finding the virtual cache located at the bell, and you can hear sound samples of the bell ringing at Verdin’s Web site or see a short video clip of the bell ringing on YouTube. Thanks to Debbie Dubrow of Delicious Baby for creating and coordinating Photo Friday to link travel photos and blog posts across the Web. I like this because it is something I'd never heard of. And if you'd told me about it and asked me to guess where it was, I would not have guessed Kentucky! Finding things we didn't know existed is also one of the reasons we like to geocache a bit when we travel! I looked for a few caches in Kentucky for us to try finding and ran across the listing for the virtual cache at the Peace Bell. It sounded interesting, so we set out in search of the site. Geocaching is one of the topics I'll probably do a few posts about somewhere along the way. It seems like almost every town has bragging rites about the "largest," "oldest" or "best" of something, and I suppose it would be easy to be sarcastic about that, but like you I love finding these places ... often it gives you insight into local civic pride & values, and sometimes it's just fun.